The long wall further south from the Southern Bluffs and buttresses visible from the TASC Lodge. 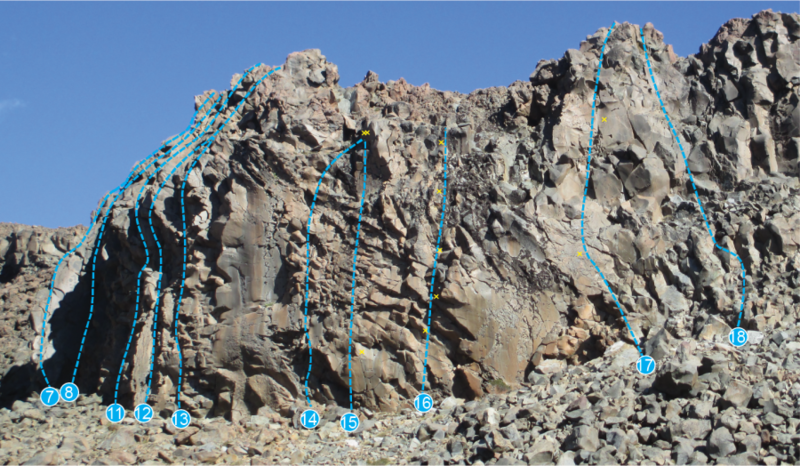 As a result of lava flows cooling on contact with ice, the crag has horizontal columns and blocks in the steep orange rock of the Fire and Ice area. Explored extensively during the NZAC Summer Camp at TASC January 2015 by the Garrity family and others. Offers full-pitch, moderate trad routes at either end of the crag on blocky ground, and a couple of bolted lines in the middle. With scope for more routes with some appealing lines on the steeper, smooth orange rock, this crag promises to be a nice lower-grade complement to the Wall of Sound. 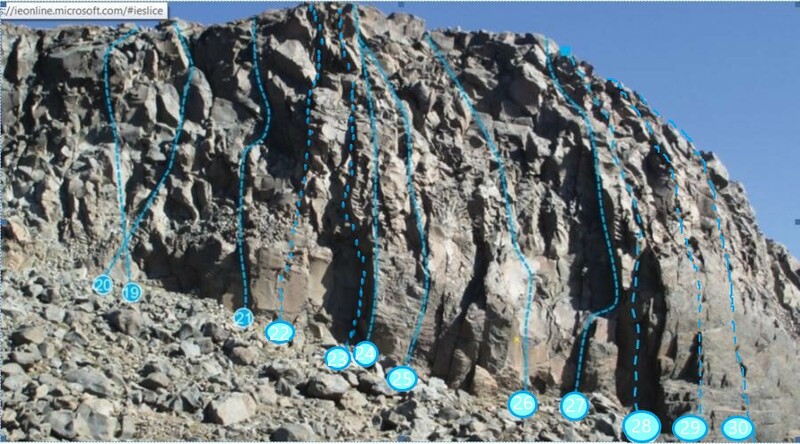 Boulders on top allow anchors to be built back from the edge (long slings or old ropes) but be aware of kicking scree and rocks on those below. From the TASC Lodge, walk around the base of the Southern Bluffs. Prominent Groove near left end of crag. Label at base. groove left of 'Slow' and keeps direct rather than veering to left. Groove just left of prominent arete. Label on bottom. 4m right of 'Slow' up corner with prominent zigzag crack. Finish up to right on steeper ground. 4m to the left of "Pleasant Thrutching". Follow obvious crack up to over hanging block. Some hard hooking moves to pull through this (crux) into pod, then more hard moves up onto snow. Finish at top of bluffs with large boulder to belay off. 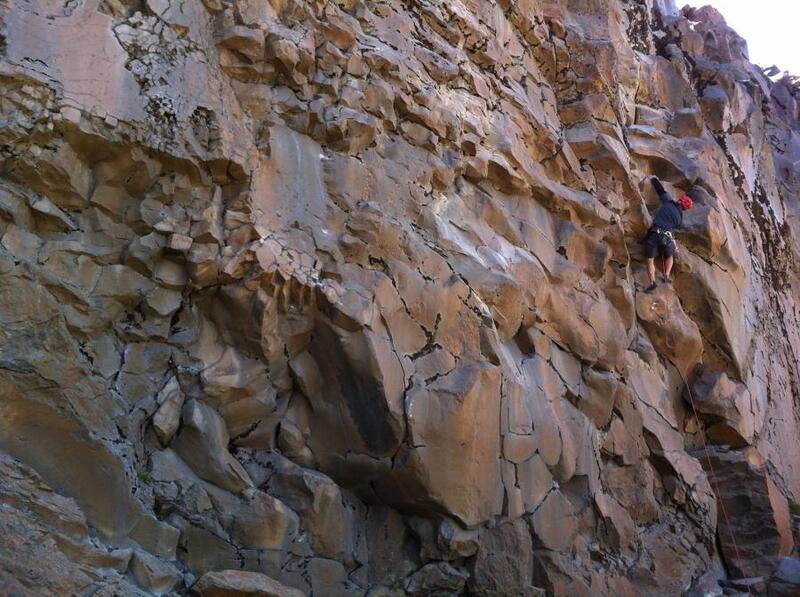 The 1st ascentionist took a fall at the crux before completing the move clean. Up corner to semi detached block. Head up and left past vegetation avoiding steep arete.. Under cling crack and move up and left into groove (crux). Step right and up to belay on large block. Easy scrambling for 5m from here to the top. Teeter up alcove to reach jug then swing up and through crux (in-situ #1 wire) before following gear placements up and left, then back right to the upper ledge and shared two-ring anchor. (Small wires and small / mid cams). Cleaned and thin gear placed on abseil. Bouldery start, truck through to ledge, clip top bolt and climb over it. No cheating left through the groove! Shared two-ring anchor. Swing up steep groove to small ledge, then left to the arete and up. Move right to two-ring anchor. Climbs the featured rock about 20m right of Fire and Ice. Three bolts plus gear to Camalot 3 or Friend 3.5. Start 6m right of 'Funbeat" and head left, up towards high point left of shallow groove. Straight up to overhanging finish from right hand end of top of talus. Start from same place as 'Doom' and follow line up to right towards block with hand crack near top. Place wire then hard move off the ground (crux) up onto ledge. Follow cracks (watch out for loose blocks) into small offwidth. Mantle onto ledge then climb up arete and corner to top. Belay using blocks at top. Arete and crack system 10m left of Flake crack. 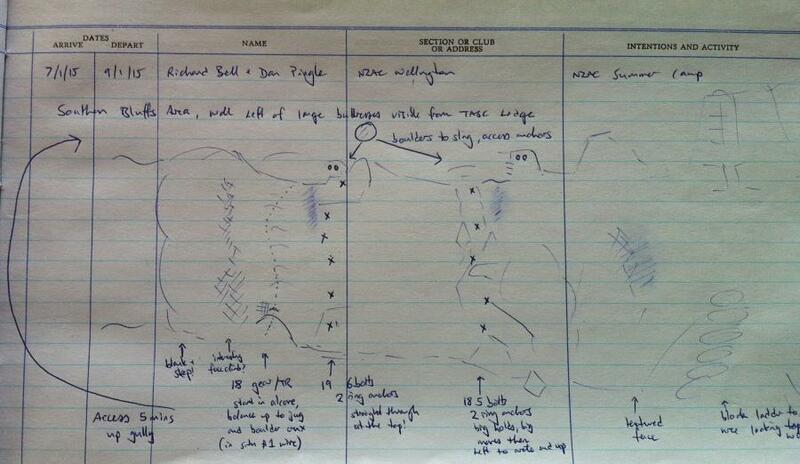 Climb arête on 2 bolts (3rd optional,not used on first ascent) then up crack system on wires and cams. Easy climbing on top section. The face crack 8m left of 'flake crack'. Steep start but a big flake makes climbing possible. Continue up crack through overhanging section. Step left then move back right. Then through second overhanging section (crux) stem and bridge the groove. Easy climbing to the top on bigger gear. Great line. about 20m down to right of 'Doom' prominent flake above a wall with a bolt. Finish up a little left once on the easier ground. Left facing corner just right of 'Flake Crack'. Start in small corner , wires for pro. From ledge move int the corner proper, clip bolt and climb ledge system and corner. Once past the 2nd bolt continue up corner on trad (cams and wires). At the top of the corner pull over block and step right. Easy ground to the top. The overhanging corner system 4m right of “Hat Trick”. Climb low angle ramp , clip 1st bolt then climb steep head wall left of corner. A good cam (2.5 friend) can be placed in left facing crack. Lay off crack and bridge corner to the 2nd bolt (crux). Once past 2nd bolt climb low angle corner to top all on trad gear. Trad belay. Follows the central weakness of steep scaly flaky looking face! But is alot more solid than it looks. Top head wall is alot easier. crux 2-3 bolt after 3rd bolt all on gear top belay gear on boulders. Start crux gaining ledge at 3m bouldery and awkward mantle if you want a alternative start traverse in. Follows the next obvious weakness to the right of volcanologist delight. Two bolt rest all on gear. A consistant climb all the way after gaining the face follow up the steep head wall over the checked board of cracked rock. My view Dave it probably more related to the way esp in the N.I in the past sometimes 6 people would be credited in the FA listings which was obviously not possible. Cragrat is not old school not giving credit to others on the first ascent. Old school is giving the credit! Fair enough Simon, edits made. Rich totally stole the gear route off me though! Rick - any thoughts on the other routes /grades? The cliff is also known as Margaret's Landing (after the ski-field's named feature Margaret's Leap above it). Margaret's Landing is the gully south and beyonf Tascmaster wall. You pas by Tascmaster wall on the way to Margaret's landing. The area did have that name for an hour or two untill the confussion was sorted. Fire and Ice routes have 10mm x 75mm true bolts, with 2-ring anchors. 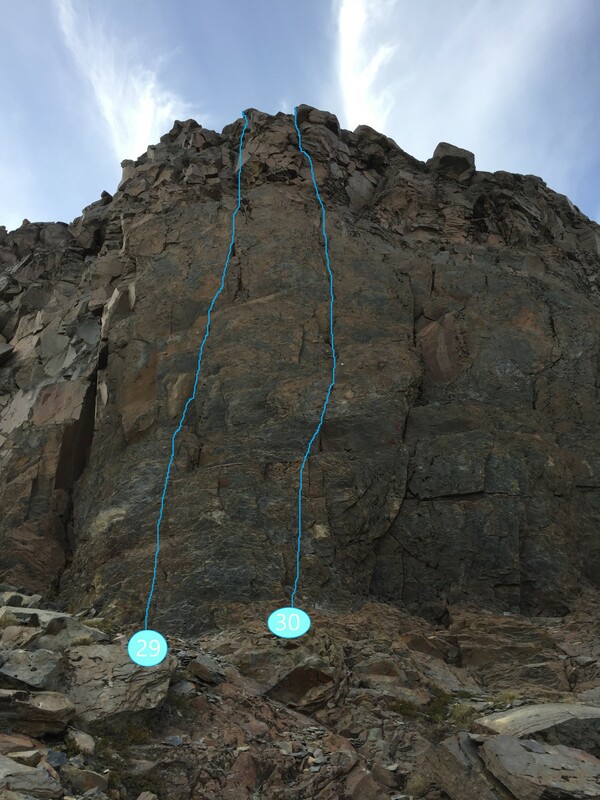 To reach these anchors safely from the top of the crag, use the access route around to the left and then build an upper anchor by slinging boulders.